The Punjab State Electricity Board’s (PSEB) decision to shut down induction furnace units in the state to tackle the ongoing power crisis has shocked almost 10,000 units in the engineering, cycle parts manufacturing and furnace industry. The murder mystery of Vikramjit Singh, whose decomposed body was found in Solan on June 29, has deepened further with the Ludhiana police claiming that another unidentified body of a Punjabi youth, found near the spot with similar injuries on June 26, could have a correlation with his murder. 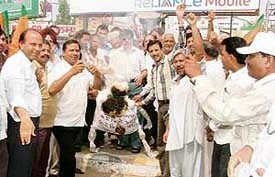 Activists of the BJP today burnt an effigy of the Punjab Government against the rising prices of essential commodities. They said the government had promised to provide relief to the common man but had failed. The city police today announced the recovery of a child of Heeran village, who was allegedly kidnapped by a migrant labourer with an intention of selling him off late last evening. SSP A.S. Rai told mediapersons at a press conference organised at Kohara village that the accused, Sonu Yadav, had taken away the five-year-old child, Gurpreet Singh, alias Gopi, last evening after alluring him with the offer of sweets. Sonu Yadav in police custody in Ludhiana on Friday. — Photo I.V. The industrial and financial capital of Punjab is in grip of fear and panic. A sense of insecurity has gripped this town following incidents of murder, kidnapping and daylight robberies. People feel that daylight robberies, snatchings and kidnappings for ransom have become the order of the day. “It is a sheer myth that Ludhianavis are not book lovers. The fact is that residents here realise the power of knowledge and value good books,” says managing director of Book Cafe, a chain of book stores being run by English Book Depot, Mr Sandeep Dutt. 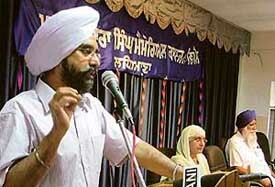 Mr Maninderjit Singh Bitta, chief of the All-India Anti-Terrorist Front, today alleged that there was a plan to bring in the dreaded terrorists from foreign countries to settle them here after getting them acquitted from the courts. Four days after residents of New Madhopuri had caught two of the seven robbers that had struck at the house of a hosiery trader, Deepak Chopra, the police announced the arrest of three other members of the gang. 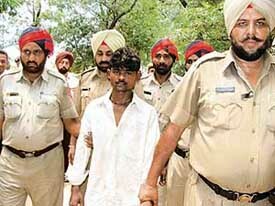 The gang that had struck at the house of a hosiery trader in police custody in Ludhiana on Friday. — Photo by I.V. A notorious chain snatcher who had reportedly committed 27 reported snatchings in Sarabha Nagar, Bhai Randhir Singh Nagar, Rajgurur Nagar and some other colonies in the city, has been nabbed by the police. The All-Traders Association of Doraha met the XEN, Punjab State Electricity Board, today to acquaint him of ‘unscheduled power cuts’ and poor maintenance in the area. The Director of Extension Education, PAU, Mr S.S. Gill, has drawn up an exhaustive schedule of training courses in agriculture and allied fields to provide “knowledge input” to the farmers to increase productivity and their income. The plant clinic at Punjab Agricultural University has been stormed by samples of cotton bearing deformed leaves and shoots. This is due to the ill-effects of 2,4-D, a herbicide. The results of BA-I were declared by Panjab University yesterday. Students of Guru Nanak Girls College excelled. Priya Sharma stood first in the college with 77.75 per cent marks. Salma secured second position by scoring 76.38 per cent marks. However, the third position was bagged by Jyoti Goyal who secured 76.25 per cent marks. A majority of students secured above 60 per cent marks. An emergency meeting of the Citizens for Public Causes an NGO, was held here to discuss the study conditions at Government Colleges in Punjab. It felt that studies were lagging behind because of a shortage of lecturers as several posts were lying vacant against permanent posts of lecturer in every subject. The proposal of the HRD Ministry to raise the retirement age of Central university teachers from 62 to 65 years has been welcomed by members of the Public Cause. Mr Yash Paul Ghai, Director, Public Cause, said it would help the government tackle the shortage of qualified teachers in the wake of the decision to increase the number of seats in institutions of higher education for reserving seats for OBCs. 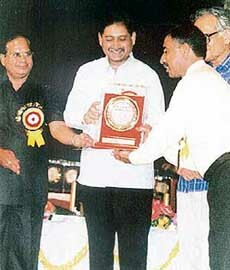 Rajinder Kumar, a teacher of garment technology in Government Girls Senior Secondary School, has received NCERT Award in Vocational Education from the PSS Central Institute of Vocational Education, Bhopal. Kirandeep Kaur of Guru Nanak Khalsa College for Women, Model Town, has topped the BA-I examinations conducted by Panjab University. She secured 82.37 per cent.